One of the most innovative and ambitious books to appear on the civil rights and black power movements in America, Just My Soul Responding also offers a major challenge to conventional histories of contemporary black and popular music. Brian Ward explores in detail the previously neglected relationship between Rhythm and Blues, black consciousness, and race relations within the context of the ongoing struggle for black freedom and equality in the United States. 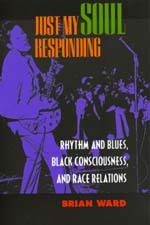 Instead of simply seeing the world of black music as a reflection of a mass struggle raging elsewhere, Ward argues that Rhythm and Blues, and the recording and broadcasting industries with which it was linked, formed a crucial public arena for battles over civil rights, racial identities, and black economic empowerment. Combining unrivalled archival research with extensive oral testimony, Ward examines the contributions of artists and entrepreneurs like Sam Cooke, Aretha Franklin, James Brown, and Berry Gordy to the organized black struggle, explaining what they did for the Movement and—just as important—why they and most of their peers failed to do more. In the process, he analyses the ways in which various groups, from the SCLC to the Black Panthers, tried—with very mixed results—to use Rhythm and Blues and the politics of celebrity to further their cause. He also examines the role that black-oriented radio played in promoting both Rhythm and Blues and the Movement, and unravels the intricate connections between the sexual politics of the music and the development of the black freedom struggle. This richly textured study of some of the most important music and complex political events in America since World War II challenges the belief that white consumption of black music necessarily helped eradicate racial prejudice. Indeed, Ward argues that the popularity of Rhythm and Blues among white listeners sometimes only reinforced racial stereotypes, while noting how black artists actually manipulated those stereotypes to increase their white audiences. Ultimately, Ward shows how the music both reflected and affected shifting perceptions of community, empowerment, identity, and gender relations in America during the civil rights and black power eras. Brian Ward is Associate Professor of History, University of Florida. He is coeditor of The Making of Martin Luther King and the Civil Rights Movement (1996). American Book Award for 1999, Before the Columbus Foundation.